To make your customer service levels exceptional see this real example of how a small action can have a big effect on customer satisfaction and then see if you can adapt it for your business. Here’s how a small business gives its customers something very simple that assures them and lets them know everything is going fine with the service they have ordered. Read this example and think how you can make this technique work for you. This one customer service action can satisfy customers. Attract more customers through word of mouth advertising. And give you the opportunity to sell more products and services. 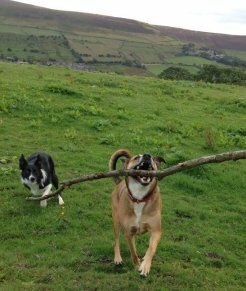 Imagine you’re sat at your desk at work and you get picturesshared with you online, like the one above, of your dog having a great time while out on a walk with your Professional Dog-Walker. While you’re at work, miles away, wondering if everything at home is okay, your dog is out on their daily walk with their dog walker and lots of doggie friends having fun, fresh air, and exercise. You knew the dog was going to be taken for a walk but the pictures make it real, you know it’s actually happened and that no problem has arisen that has prevented it from going ahead today. You can get on with your day knowing the dog has been taken care of, and as a secondary benefit you know that if there was a problem at the house the dog walker would have contacted you. Wouldn’t it be great if we got the same service from other suppliers and service providers, maybe even your business? The dogs in the picture above are Webster and Skyler and their Dog-Walker is Cara Taylor. How would you feel in the middle of a hard day, miles from home, and you could see these pictures of the walk your dog had is having. At first you might think that sending pictures is a great idea for small businesses like Walk the Dog but how will it benefit me and my business? For many years I worked in the service industry and one of the most common customer complaints was not being told when a delivery of service couldn’t take place on the day, or at the time, that it was scheduled to be done. Problems that can’t always be avoided can happen when people and transport are used to provide a service. Customers understand this but what they don’t understand is why companies don’t tell them there is a problem. Communication when things go wrong is an expected level of customer service not an exceptionable level. Letting a customer know that there is a problem, and exactly what that problem is, only brings your business up to customer expectations, you have to do a lot more be exceptional. Companies are now using the online communication tools available to inform customers when there is a problem, and some are taking it further with online tracking of parcels and goods, expected delivery time of your order, and checking your account online. But could you do better? What about communicating with real pictures when things are running to schedule and when they’re not. 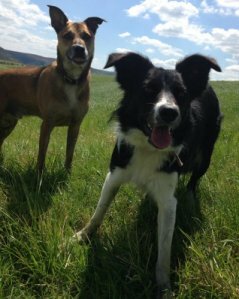 Using pictures could small businesses and large organisations create the same feelings in their customers as Cara the dog walker does when she sends pictures of people’s pets bounding across muddy fields with a large stick in their mouth? Yes, I think many of them could. While we all attach a great deal of emotion to our pets, and that’s part of the big effect of the small action when Cara takes pictures, lots of other businesses can hit people’s emotions with their products and services. Not always because of what the products and services are, but also because of what it means to their customers. Knowing a service has been completed can take away a worry for a customer and allow them to get on with other things that are not running so smoothly. A direct sales customer having a service carried out in their home, but being at work as the service is done, will feel very satisfied and relieved to have images of the progress throughout the day and know that there are no nasty surprises waiting for them when they get home. How about when you have your car serviced. Wouldn’t it be nice to have a picture sent to you as your car goes into the workshop or on to the ramp as they start the service. You then know that they’ve started and that they’re on schedule and it should be ready on time. Does your window cleaner or gardener let you know when they have been to your house? If you’re not there the first you might know about it is when they come to collect the money. You might wonder when the service was done if you hadn’t noticed on the day which raises doubts in your mind. A picture sent to you after completion would be exceptional customer service and stop any doubts. People are also more likely to show pictures to friends and colleagues than they are to bring up the services in conversation without the pictures. People are proud of their houses and how they maintain them and a picture gives them the excuse to show it off, and every time they do you will get free word of mouth advertising. Imagine it, your customers selling your service on your behalf, all you have to do is send them the best tools to use. Assess your customer service levels from a customer’s viewpoint. Look for how you can improve and maintain exceptional customer satisfaction by using and adapting ideas, like the ones here. Grow word of mouth advertising because customers see you as exceptional and talk about you. Increase sales by using your service actions as a vehicle for offering more products or services. When a customer feels good because of something you have just done that’s the best time to make additional sales or Ask for referrals. Incorporate marketing actions into your exceptional service actions. When you send a picture of something good happening include a sales pitch on another service. When a customer likes your picture ask them for recommendation to friends and colleagues. When problems arise use pictures to communicate the problem and to show what you are doing to resolve it. Here’s another customer service action based on the same idea, free information. Just like the free pictures from Walk the Dog, free information in the form of eBooks works for businesses that don’t have anything visual to photograph.